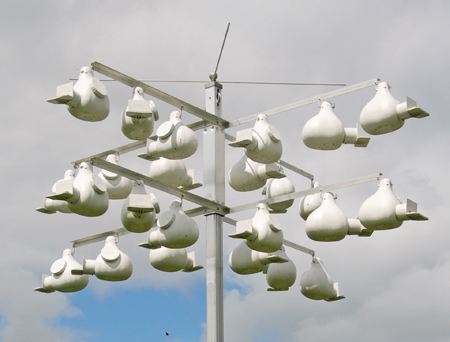 All of the gourd racks and rack systems (Gemini, and Super System 24) we sell on this website already include the appropriate number of Gourd Mounting Arms (GMAs), but in the future, you may want to offer your martins a mixture of gourds types from several different manufacturers. Choose part #GMAHS for hanging Troyer Gourds, some S&K Gourds and SuperGourds that have been drilled front to back in the neck of the gourd. The gourds entrance hole faces out and away from the pole. Used at the end on Super Systems 24, and is included with your 8-Unit rack. The AAA16 includes 8 of this model. Not compatible with Geminis. Choose part #GMAH90 for hanging Troyer Gourds, some S&K Gourds and SuperGourds that have been drilled front to back in the neck of the gourd. The gourds entrance hole is directly below the gourd-hanging arm. Used on the innermost part of the Super Systems 24 angle arm (closest to the pole) and on the rings of the Gemini. The AAA16 includes 8 of this model. Choose part #GMAH45 for hanging Troyer Gourds, some S&K Gourds and SuperGourds that have been drilled front to back in the neck of the gourd. The GMA 45 is only compatible with the Super System 24 and you can use them on the AAA16, on the innermost hanging hole. Used in the center position on the SS24 angle arm it will face your gourds entrance at a 45 degree. Helps in male dominance. 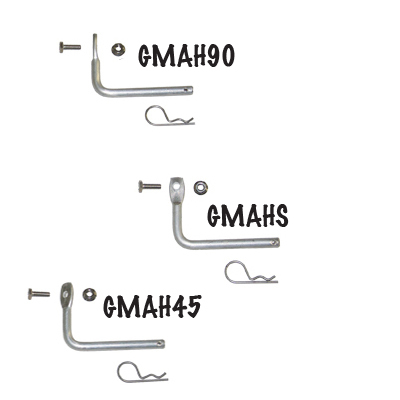 Each 3/8" solid aluminum gourd mounting arm comes with a stainless steel whiz-lock nut, bolt, and hitch pin. Accommodates any gourd with a neck up to 3" in diameter at the drill hole. Mix and match.